The company has recently expanded into the hot hot hot energy drink world with two offerings: Big Jones Energy Soda and Whoopass Energy Shots. If I could, I'd buy into the company. They rotate different black and white photos on the labels of their sodas, and they've got feel-good propaganda on their bottles and on their website. If I had any cajones at all, I'd be this brave. Maybe if I drank some Whoopass I'd get out of the academic world and start making soda (or cheese, or chocolate) and be a nutty corporate wonk of the flaky variety; I'd wear ribbons and sandals and really let the big belly go. The book project is on hiatus for 8 wonderful days. 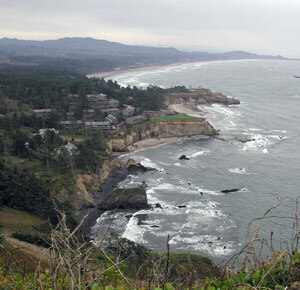 We've rented a lovely house in Waldport, Oregon in order to give us a chance to save up some strength for coming months. I started this project more than 2 months ago, but my wife and I have been rolling in Winnie Cooper for exactly 1 month. 25 poets so far. 3500 miles in September. 4000+ in October. Gasoline? Hamburgers? Ice cream sandwiches? I don't even want to count those things. The shock and dismay would cripple my already withered spirit. But really, would God have made so many varieties of the ice cream sandwich if he didn't want me to try them all? So, the trip has a wondrous upside. Not least of which is the unending string of interesting poets, all who welcome us - albeit briefly - into their lives and work. I continue to be appreciative of their help as the book continues its growth. This week I sent out some proposals to some university presses. I hope to get an editor interested in the project, and I think we're at a good point to do that. The project is taking shape on this website, but the real meat, the interviews, are still on my computer, still on tape, still getting transcribed. Their addition to the website blurbs will really bring the themes of the book together. There's some real poetry in the interviews.